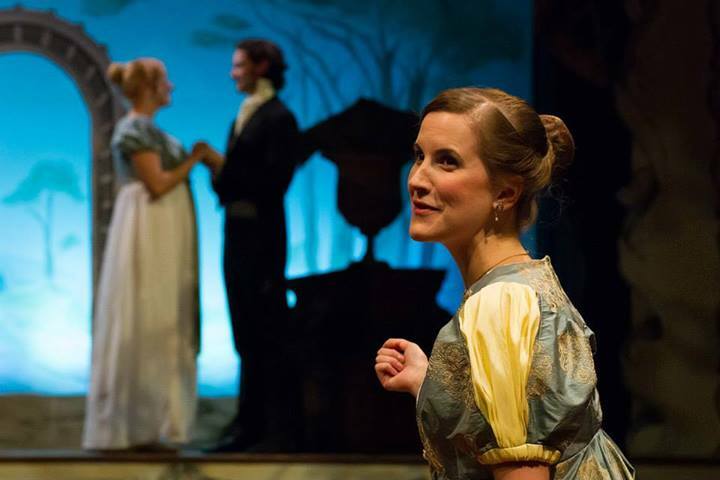 Angela Smith as Harriet Smith, Trevor William Fayle as Mr. Elton, and Lauren Sowa as Emma Woodhouse in Lantern Theater Company’s production of Jane Austen’s EMMA (2013). Photo by Mark Garvin. Janeites know what I’m talking about, and have been celebrating Pride and Prejudice’s bicentennial in a wild variety of ways across the world. The Jane Austen Centre in Bath, UK hosted a ten-day long festival with Austen duologues, etiquette and harp workshops, and a Grand Regency Costumed Promenade, among other attractions. Cruise company Cunard World Club is offering an Austen-themed cruise, and the Bank of England has announced that Charles Darwin’s pensive frown on the £10 note will be replaced with—that’s right—Jane Austen’s curiously crooked, wry little smile. Locally, Philly’s Lantern Theater is curating their own festival dedicated to Austen’s work and world: Regency and Revelry. The Lantern might be the perfect company for this celebration. Known for dramaturgically precise productions of plays both classical and modern, the Lantern’s works range from their annual Shakespeare (who can forget the acrobatic Geoff Sobelle in Hamlet in 2009; this season it will be Julius Caesar) to Anton Chekhov, from Noël Coward to Athol Fugard. But who knew that Philly was the perfect city, just bursting with experts on Jane Austen and Regency England? Kathryn MacMillan, a self-pronounced Janeite and associate artistic director of the Lantern, didn’t know, not until after she’d already announced that the festival was going to happen. 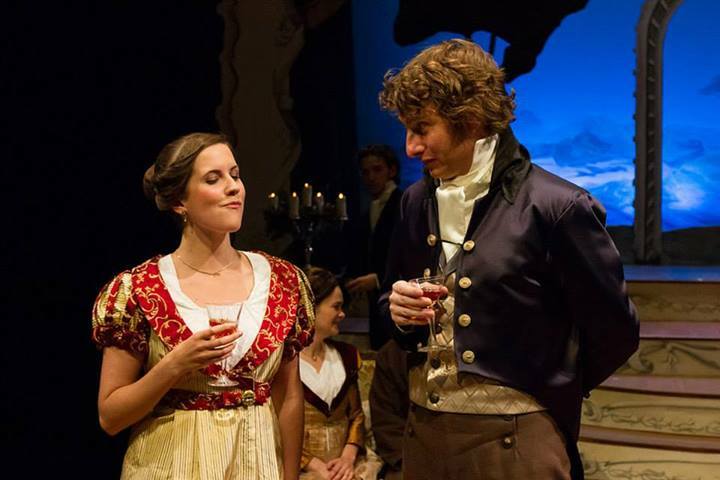 Lauren Sowa as Emma Woodhouse, Charlotte Northeast as Mrs. Weston, Trevor William Fayle as Mr. Elton, Nathan Foley as Mr. Weston, and Harry Smith as Mr. Knightley in Lantern Theater Company’s production of Jane Austen’s EMMA (2013). 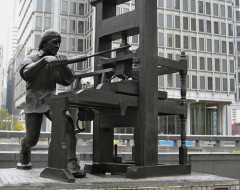 Photo by Mark Garvin. Sullivan, of course, has been recruited as well; she will deliver a lecture on the differences between Austen’s time and our own on Saturday, October 12. Lantern’s dramaturge, Gigi Naglak, just happens to be an expert on tea rituals, and is leading a full education on English tea rituals through the ages on Sunday, October 13 (unfortunately already sold out), and the Lantern’s choreographer in collaboration with the Germantown Country Dancers are leading a Regency dance lesson directly following Sullivan’s lecture on Saturday. “We have done Fall festivals for about five years now,” MacMillan goes on, “and we are always looking for scholars and experts who can share their knowledge with our audiences.” It is the Lantern’s intention, with Regency and Revelry, to provide an immersive experience of Austen’s world. 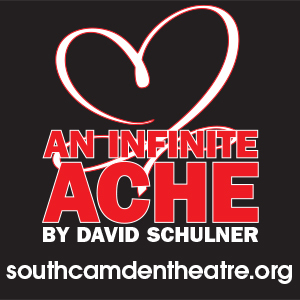 A wine tasting on the 11th at 6, followed by a performance of Emma at 8 and post-show discussion with the cast. A script-in-hand production of Austenatious, a musical Austen extravaganza by 11th Hour Theater Company running on October 13 and 14. A Jane Austen book club, which has already gone in depth into Pride and Prejudice and Sense and Sensibility, and is discussing Emma on October 20, led by another local scholar, Janine Utell. Jane has been a long time in coming to the Lantern. “We’re still a growing company,” says artistic director Charles McMahon, “and five years ago we really weren’t in a position to produce this piece to its best advantage. As the Lantern has grown in resources, it has also become a keystone of Philly’s theater scene. Go to Emma, or participate in any number of their extracurriculars, and see for yourself if they’ve met the challenge they set themselves.